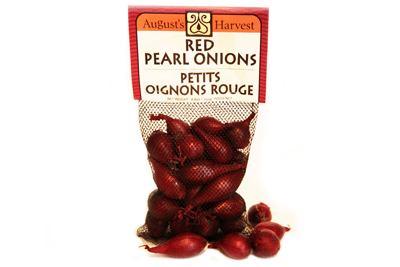 Red Pearl onions are oblong and resemble the shape of shallot. They have a red skill with a purple and translucent flesh. They have a crisp, savoury and pungent flavour. They can be used in recipes that call for onions. They can be deep-fried, grilled, roasted, braised & pickled. Used in soups, stocks, pickled and used as a condiment in cocktails. Pearl onions will keep, cool and dry, for up to a month. Store in a cool and dry, for up to a month.